Rosetta, as of August 6th when this was written, was orbiting 100km above the comet’s surface, sending details about its new friend back to Earth. For the next few weeks, Rosetta’s main task is to search for the perfect landing site for the probe Philae that it’s carrying. If everything goes well, on November 11th Philae will become the first probe ever to be dropped onto a comet’s surface! But Rosetta’s journey won’t end there, for many months the little spacecraft will travel alongside the comet as it swings around the Sun and back out towards Jupiter again. 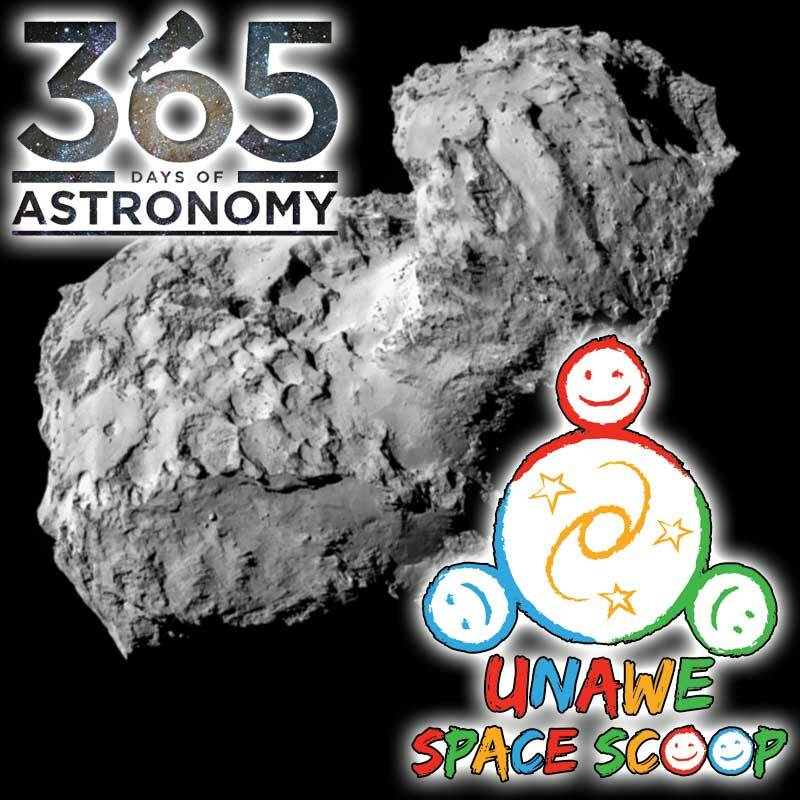 One year from now, in early August of 2015, the pair will approach the closest point to the Sun on their tour of the Solar System — this is where the comet will really begin to shine. Comets are lumps of cosmic ice and rock, which means that as 67P travels closer to the Sun it will begin to melt. Well, not so much melt as sublimate. That’s where a solid like ice goes straight to a vapor without first going through a liquid phase. Cool, eh? The vaporized ice from the comet will create a magnificent tail like comets are known for. We had a couple of nice comets back in the 1990s but unfortunately 67P won’t be visible in our night sky without a powerful telescope, even with its tail. Instead, Rosetta will provide us with something better — an up-close view of how the comet changes in the glare of the Sun! Here’s a Cool Fact: The mission is named after the Rosetta Stone, an ancient stone tablet that allowed us to decode ancient Egyptian Hieroglyphics. Like the Rosetta Stone, ESA’s Rosetta mission will reshape our understanding of the past by unlocking the mysteries of comets, objects made from the leftovers of when our Solar System formed.